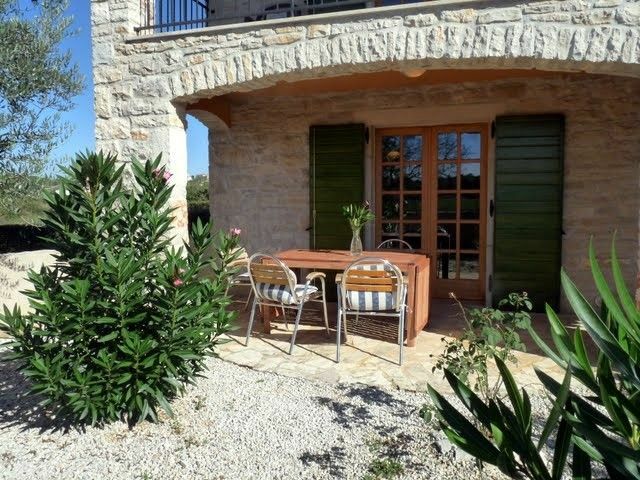 Beautifully appointed 2 bedroom air conditioned 3 storey self catering Istrian stone cottage set in lovely rural location between Istria's tourist mecca Porec and the rolling hills of 'The New Tuscany'. Ask for our QuickTime movie. Views over vineyards and olive groves in this tiny hamlet 5km from Istria's main tourist destination. Enclosed garden with olive tree and locking gate. Covered patio area with garden furniture. First floor bedroom also has a terrace with fine views of the surrounding vineyards and farmland. 10 minutes from Porec & resorts Plava Laguna (Blue Lagoon), Zelena Laguna (Green lagoon) and Bijela Uvala (White Bay). Waterskiing, windsurfing, scuba diving, boat & bike hire available. Pula, home to Europe's 3rd largest amphitheatre and gateway to stunning Brijuni Islands (where you will find Tito's palace, a safari park and a unique golf course) is just 40 minutes away. Local Amenities: All facilities, supermarkets, banks, ATMs, travel agencies etc available in Porec. Local restaurants serve wonderful food with a strong Italian influence, great Pizzas and pastas, as well as sea food caught daily and very drinkable local wines. Don't miss the Istrian truffles with steak or fusilli, Prsut (the local dried ham), sheep’s cheese, wild boar with pasta, and raw fish gaspaccio. Croatians seem to excel at all sports, illustrated by Russia WC 2018, and local hotels offer excellent facilities, many with tennis centres with indoor and outdoor courts. At the Hotel Diamant there is a superb 'Wellness Centre', with gym, pools, sauna, steam room, treatments etc. The beaches in Istria tend to be pebbly, rather than sandy, with a few exceptions. There are purpose built paved platforms with steps down all along the water's edge, which are ideal for sunbathing, particularly if you don't like getting sand everywhere! The Adriatic is one of the cleanest seas anywhere, winning praise from Jacques Cousteau as one of the most beautiful seas he had ever dived in. Getting there: Low cost daily scheduled flights from Stansted, to Pula (40 mins from house) and Trieste (around 90 mins). EasyJet and Whizzair fly Luton to Ljubljana (90 mins) and EasyJet now fly Gatwick to Pula. Other carriers have cheap charter flights to Pula and Rijeka. Scheduled flights also available. Car hire available at all airports. Feel free to call Mike or Ria for help finding flights and car-hire. Visit and find out for yourself..... Istria is a very, very special place, Come and see the blue and green of Istria - beautiful coastline, fjords, and hilltop towns, We love it and I'm sure you will too. 5km from Porec, Croatia's most popular tourist destination yet in a small tranquil hamlet where you can truly unwind. Downstairs cloakroom. First floor family bathroom with shower, wc etc. Aircon in both bedrooms. Double as hearing. Aircon in bedrooms doubles as hearing. Electric oil radiator in lounge. Space for 2 cars on street at the front of the property. We have WiFi during the main tourist season, May through October. House towels provided but please bring your own beach towels. We have made a Quicktime movie to let you get a better picture of the layout and the rest of the accommodation. Please contact us for the link to download this virtual tour. You will need Quicktime or iTunes to view this movie. Once loaded, you can move from room to room, up the stairs and outside (Click to change nodes when the cursor changes from a circle to an arrow). In each location you can drag through 360 degrees, zoom in and out with shift and control keys. The file is 3MB so will take a few seconds to download.... please be patient. Also, this movie was shot a couple of years ago, so you won't see the bannisters, air-con and landscaped garden. Well maintained, comfortable, peaceful location. The house was well maintained and contained everything that we needed for a comfortable stay. We enjoyed being in a peaceful location but within easy reach of many lovely places to visit. Neighbours were friendly and we appreciated very much the gift of fresh figs and grapes. Having the balcony outside our bedroom was a great bonus and we made good use of it. Rather disappointingly - and contrary to the information with which we were provided - there were no places to eat within walking distance. The restaurant in Muzalez had closed down - it seemed as if that had happened some time ago. We wandered around the village until we found what had been Bepo's Grill, recognising it from a leaflet in the house, and there was no sign of that ever having been a restaurant. It would be helpful, therefore, for information to be updated. By exploring around the village, we found a few nice walks, including one into Porec. Again, providing such information in the house would have been good. Setting aside those few niggles, we had a lovely holiday and would recommend the property and the area highly. It was a very Nice stay in Villa Maria. The cottage is confortable, well decorated, with natural colours and matérial. We loved Porec and istria in général. Very nice house in little village near Porec. Perfect for family holiday, quiet but close enough to the tourist Center of Porec and to beaches and restaurants. House was very clean, neighbours friendly and helpfull. Ein sehr schönes Haus. Wir haben uns sehr wohl gefühlt. Das Haus liegt schön ruhig in einem kleinem Dorf mit netten Nachbarn. Zum Strand, Einkaufen und für Ausflüge eine gute Lage. Die Nachbarn, die sich um das Haus kümmern waren sehr freundlich und hilfsbereit. Ein Dankeschön! We had a most enjoyable stay at Villa Maria which is in a very small and friendly village. We felt we had made a good choice in both the property and location. The neighbours, who look after the property, were very friendly and generous in supplying us with pears and very tasty grapes. Porec is very beautiful and interesting. There are also many other places of interest to visit. We found a picturesque beach for swimming at Ulika. Like most beaches in Croatia it is rocky and stony but with a pair of jelly shoes it is not a problem - sea was pleasantly warm at this time of the year. A few good restaurants locally and a large choice in Porec. We barbequed a couple of times. Only negative point: TV sound would not work through satellite box and DVD player did not work (juddering and stopping). I let Mike know and I'm sure he will sort this out. A very minor point and we would recommend this accommodation without hesitation. The cottage is located in the peaceful village of Valkarin, just a few minutes drive from the sea and the picturesque and historic town of Porec. There are many pretty and interesting towns and villages to explore within easy reach of the cottage. Sample the local cuisine in one of the many restaurants overlooking the clear ocean on one of the marinas at either Porec, Rovinj, Novigrad or Vrsar. Enjoy the journey inland through pine forests and rolling hills. Discover the ancient hill-top towns of Motovun, Grozjnan and Hum. A daily return fast cat ferry service (2 hours) runs from Porec harbour to Venice. Other places to visit: Hum (the smallest town in the world.) Baredine Caves, Limski fjord (taste the beautiful cheeses, olives, wines and Grappa). The Amphitheatre in Pula is an amazing, historical place to visit. Prices shown are for the property per week in UK Pounds and Euros and include local taxes. Any rental period possible, discounts possible for longer periods.